As a Marine Mammal Research Volunteer you will have the opportunity to assist with data collection while enjoying the amazing experience of being out at sea! You will be armed with a camera, binoculars and survey sheets in order to record sightings of humpback whales and any other marine life that passes through (orcas, whale sharks, manta rays). Humpback whales typically migrate through Mozambique between June and September. 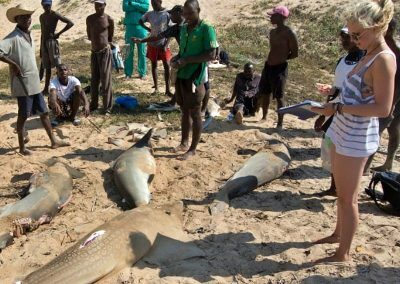 Our research team in Mozambique is collecting data on these magnificent creatures, looking at surface behaviour and pod formation, never before studied in our area. 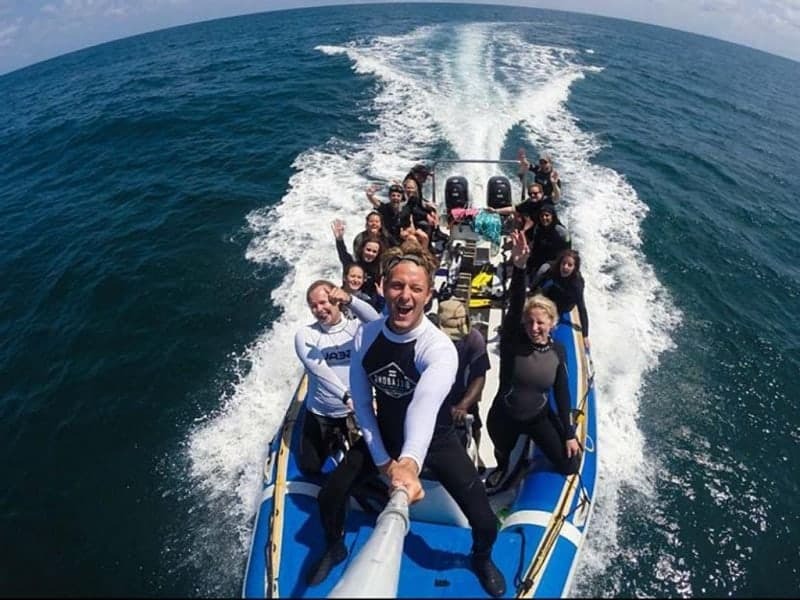 As a Marine Biology Volunteer on our Ocean Safari Volunteer Experience, you will learn about how to successfully photograph marine life. You will be learning about humpback whales, whale sharks and manta rays and why the conservation of these species is so important. Your skills will then be put to the test on ocean safaris where you can practise taking ID shots. We are dedicated to ensuring the survival of Mozambique’s biodiversity; and that is why our research team is collecting coral reef data to show that our area is worth protecting. As a coral reef research volunteer you will be trained on how to conduct our coral reef survey, and once you are qualified you may have the chance to assist our research team! The aim of this research is to gather enough evidence to push the government to change fishing legislation and create a Marine Protected Area. We believe that establishing a Marine Protected Area will create opportunities for eco-tourism, bringing much needed income into the region, and provide a viable alternative to unsustainable fishing. As a fisheries research volunteer you will be collecting data that allows us to assess how sustainable the fisheries are. From these assessments, eventually we would like to determine minimum landing size for individual species, as well as changing certain fishing legislation. You will be conducting this research along the beautiful coastlines of Guinjata Bay and Paindane Bay. 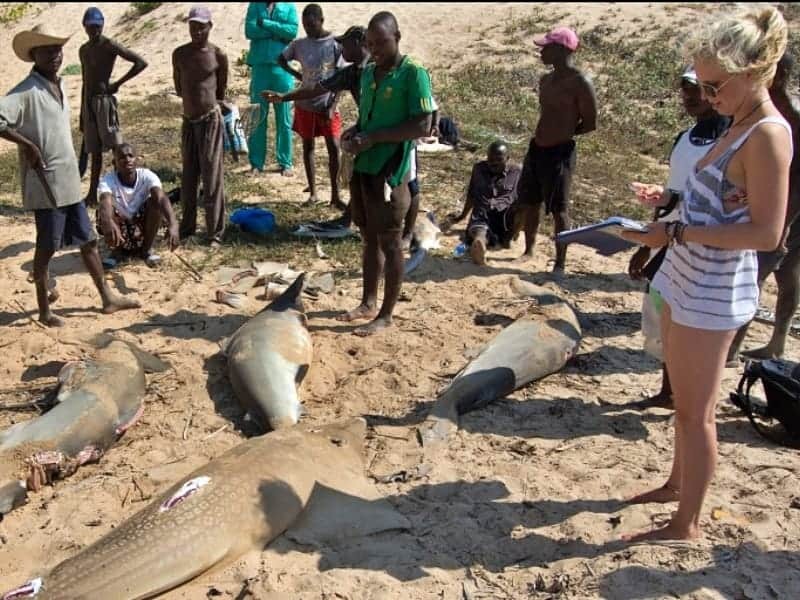 As a volunteer on this research project you will be responsible for recording the data into the logs along with the corresponding images (checking shark and ray IDs with a field specialist if you are unsure), cleaning the collected shark/ray vertebrae, and ensuring equipment is clean and stored. As a Coastal Restoration Volunteer you will be assisting us to clean up our local beaches. Unfortunately plastic pollution is a human-induced problem the world over. You can also help to improve schools in Africa! 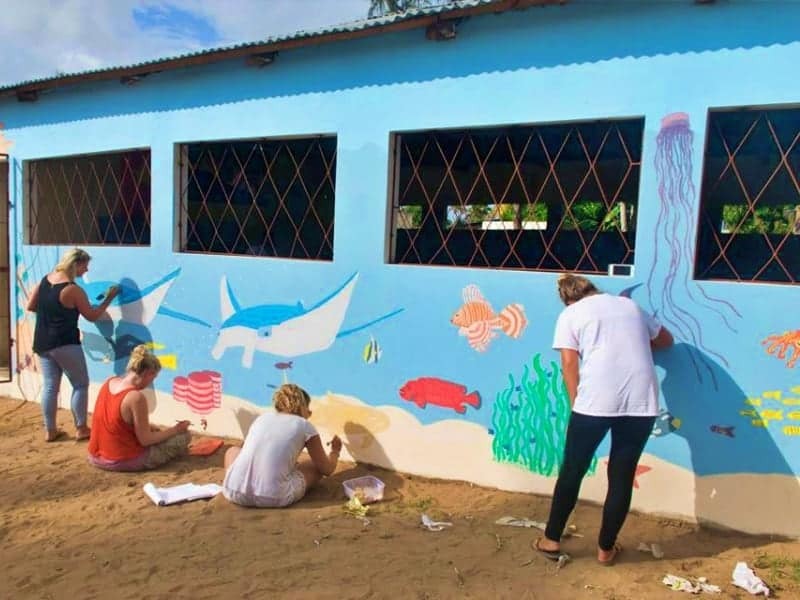 Help us brighten up local school facilities in Mozambique by painting educational murals. in Mozambique and that is why with the help of our Teach Swimming Volunteers we provide weekly swimming lessons for local children. Surprisingly few local children are confident in the water, and through these lessons we improve water safety skills in the community, as well as igniting a passion for the marine environment in the younger generations. We hope for a future where the local community both want, and are able to, experience the underwater world for themselves. 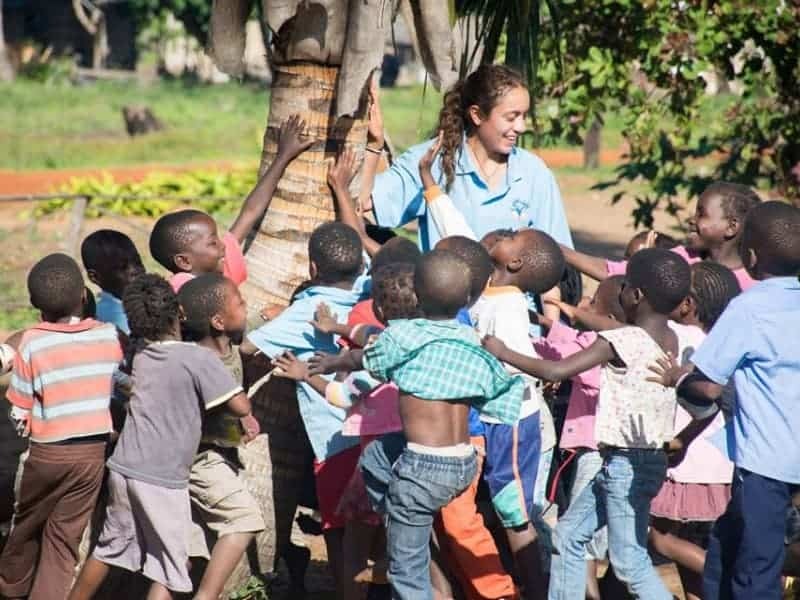 Mozambique is a unique and inspiring country with a lot to offer visitors. 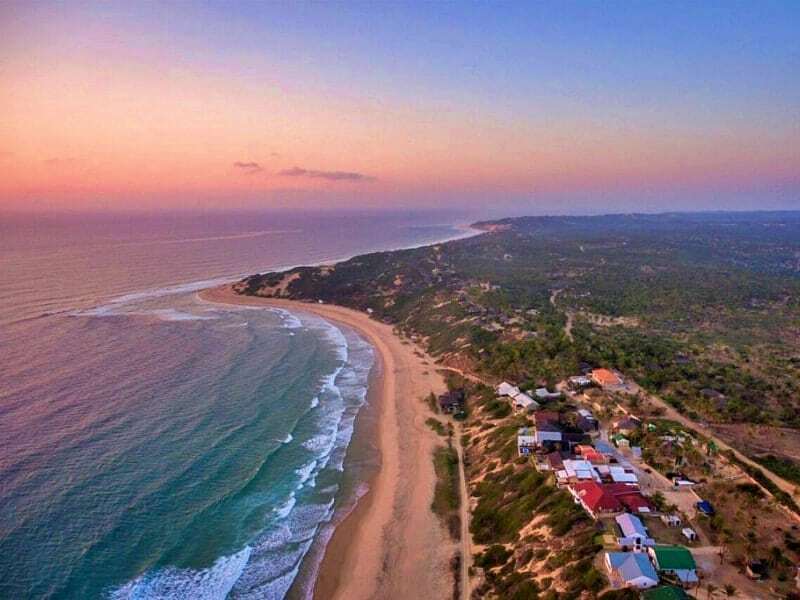 Located on the South-Eastern coast of Africa, Mozambique is one of Africa’s rising countries with an upbeat atmosphere and a beautiful 2500km coastline. 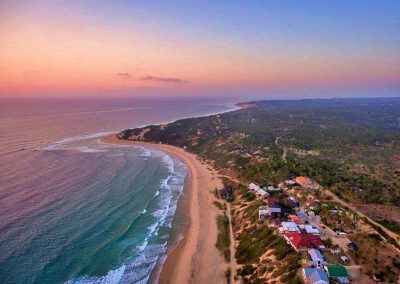 Guinjata bay is located in the Inhambane Province, in the South of Mozambique. This province is known for its massive displays of coconut palms, cashew trees and citrus fruits. There is a tropical climate throughout, although it is more humid along the coast and dryer inland. Guinjata bay is an idyllic location for international travelers to visit. Picture sipping on a cocktail while you relax under a coconut tree and listen to the waves! Wake up to the sound of tropical birds and smell the ocean breeze in the morning…and of course this area offers an array of water activities such as snorkelling, surfing and diving.